There is a special thrill of hunting on the opening day. There has been a year’s gap since you ever harvested rabbits. But don’t forget that the late season can be good too. All you need are these rabbit hunting tips. Earlier when farming operations and urbanization was not encroaching on the rabbit hunting areas, the rabbit hunters would spend the whole day in one patch and hunt for rabbits. Conversely, a technique called leapfrogging has been developed since there are no large blocks of territory. In leapfrogging, the hunter chooses one patch and hunts for a while and then moves on to another on. This way there is a greater chance for the hunter to get rabbits. Take the help of a farmer. They work on the land daily and know the cottontail concentrations. This way you will get a patch where there are many rabbits. Cottontails are more active early and late in the day and they especially go near the fringes of fields or roads where there are briars and thickets. If you drive along these rural roads, you will be able to get a glimpse of where the rabbits feed. Cold and miserable days provide the best gunning. Rabbit fur does not have good insulating qualities and so the rabbits are forced to take shelter from the weather. That makes them easier to find and less likely to flush wildly. Hunt in places, which are sheltered from the wind and are open to sun rays. Of all the rabbit hunting tips, this one is very important: look them in the eye. That means that search for their eyes rather than their whole body. The rabbit’s eyes are dark, round and look out of place against the crisscross of the brush and weeds. The main thing to remember is to see the rabbit before it sees you. Rabbits are highly nervous animals. Therefore, you use this quality to your best advantage. When you enter the area where you think your rabbit is, then walk ten paces towards it and stop. The rabbits think that they are detected and they decide to make a run for it. Cottontails love clover. Therefore, wherever there is clover you will find rabbits. In cold weather, the clover tends to stay a little longer than the other plants because it is a legume and it releases nitrogen in the soil. Therefore, there is green vegetation around it. It is usually found in loose, sandy and well-drained soil. During the warm-weather months of the year, the rabbits like to eat and stay in blackberry and raspberry bushes. They offer food and protection. The rabbits like the young, tender shoots as a tasty food source. Saplings that are found in large stands of half an acre will always hold a few winter rabbits. As there are no clover or berry bushes, they go for the saplings. Rabbits are fond of young deciduous trees. The rabbits eat around it and not a single tree is spared. Look for these marks to find where the rabbits are. These are some rabbit hunting tips to get you started with rabbit hunting. 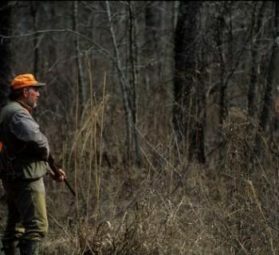 However, you should always stay in touch with professional hunters so that you can learn better skills.